It is 5˚. I went outside today and felt warm. I didn’t zip my coat. I was ok without a hat. I didn’t need gloves. It was amazing. I got gas today because it was so warm. The phrase: “It’s all relative” has never meant more to me in my life. For the last 5 days, it was ranged between -11˚ and -1˚. Being outside for more than 2 minutes makes parts of your body ache in pain. Anything exposed to the elements is fair game. I am able to count how many nose hairs because I can feel each one individually freeze. The kids can’t play outside and I’m tired of picking up blankets that have been made into forts. When I take the kids to school, they don’t have to get dressed in snow clothes because it is too cold to play outside. They keep putting dirt on the roads, but only right in front of stop signs. You can slip and slide in the middle of the road, but will regain control right before the end of the road because there is 2 feet of dirt. I don’t understand Montana. Sometimes I feel as though they are surprised every year it is cold and snowy. Due to this cold, we have a Charlie Brown Christmas Tree AGAIN. One side of the tree has no branches. Last year we cut off branches and drilled them into the side of the tree and wired them into place to make the tree look fuller. There is no point when your tree only has branches on ONE SIDE. Kevin’s excuse is that we went tree hunting when it was -8˚. I agree this is cold. I agree that I would not want to go into the woods and find a tree in this weather. That is why I want to go to a tree lot and buy one. Permits are $5. Trees in lots are @ $50. Our tree this year, however, is not even worth $5. I don’t think I could get more than $3 on the open market. With the recession, maybe $2.50. I have been thinking about making it a true Charlie Brown tree. I could buy a real one that is full and luscious and tell Kevin it looks that way with the ornaments on it, but it is the same tree. 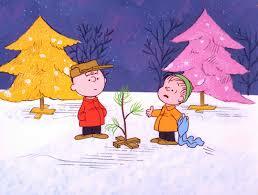 Charlie Brown’s tree gained at least 100 branches once it had Snoopy’s ornaments on it. The real kicker is that we aren’t supposed to cut down the type of tree it is. Of course Kevin just looked for a tree. He probably would have cut down an Oak if it were close enough and looked Christmasy. So, we have a pathetic, illegal Christmas Stick while living in the arctic. Tis the season.